When I first discovered these wreaths and how to make them, I hoarded the information like it was a cat skeleton. I sold them to consignment stores, and was pretty excited that I new how to make these and other people didn't. They had to buy them from me! I've since seen the selfishness of my ways, and decided to finally share the precious How-To with you all. There are three different styles that I've made (pictured below). 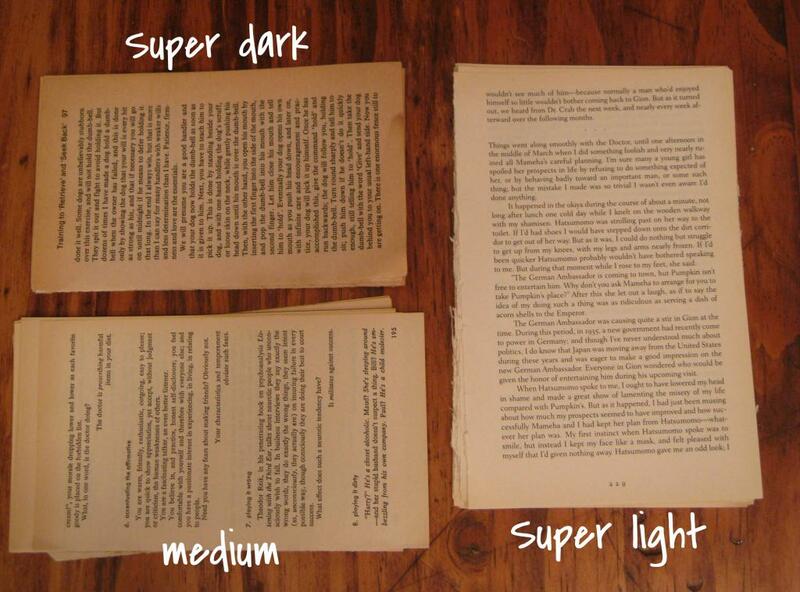 To achieve the different looks, you can use books with various page yellowing. The older the book, typically, the darker the pages. You can also combine colors for a sun-effect. First things first, you need to choose your books. You need about 500 pages - one long book or two average sized books. Next you need to decide what darkness you want the wreath to be. Know that the color of the edges of the books doesn't necessarily indicate the color of the page itself (example: some books have gold edges, but this detail won't actually show when your wreath is finished). What matters the most is what the inside of the book looks like. Here is a variety of colors for books. I really love the really dark, antique pages. Water-damaged books are really good, and you can usually find really old, discolored books at thrift stores for really cheap because nobody else wants them (silly people!). It goes without saying the contents of the book have nothing to do with anything. Make sure if you're using different shades that you alternate well or use the outer ring method, or you'll have blocks of your wreath that are different shades. Carefully cut or rip the pages from the book. Try to keep the pages' shape. 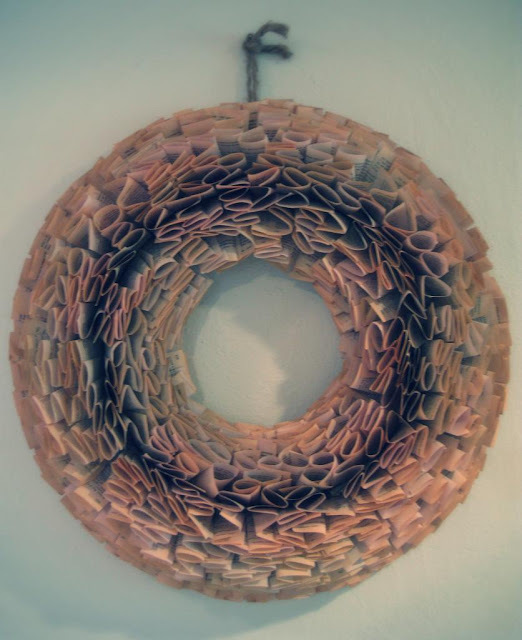 Start by taking your paper long ways and bending it into an S or an O. I use both in my wreaths. I just alternate shape, and it gives a different fullness to the wreath. Thread the paper through the first rung of the frame (the one closest to the center). Add layers as desired, and work your way outward in each section. Glue along the metal, and gently fold the paper in the center to set the glue (try not to crease the paper too much). Working in the sections on the frame, repeat this step a million times (this is where you will use the movies), until your wreath has the fullness you want, then you can attach string to the back and hang it where you please! Tip: The pages on the bottom rung should be facing inward toward the center of the wreath. As you move up the rungs, make them face upward, so once you get to the top rung, they are facing outward. You'll have a nice arc. Tip: for the pages you don't use, stick them in a ziplock baggie to keep them all together, and save them for a later project!